The US and Asian stock indices have been pretty steady so far and that is also true for the German Index. The DAX is trading in a strong but steady manner and continues to move higher fueled by some strong investor sentiment as the earnings season kicks off. It closed the day above the €12,700 region. Looking ahead to the rest of the day, expect a strong and steady opening to the index for today and lookout for a bullish run towards the next resistance level. The bulls still maintain the upper hand. The index is still trading above its 100 period moving average. 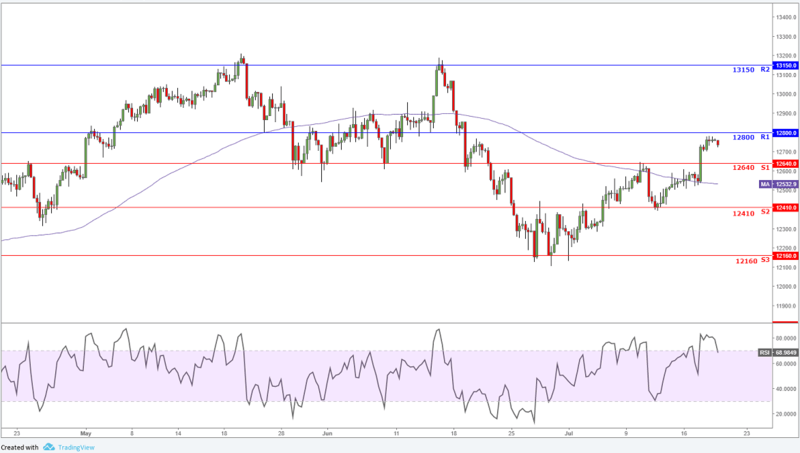 Short-term expectations are a slight move up followed by consolidation or possibly a selloff as the RSI points towards a possible bearish price movement back to the support zone between €12,640 and €12,410 within the next 2 days.